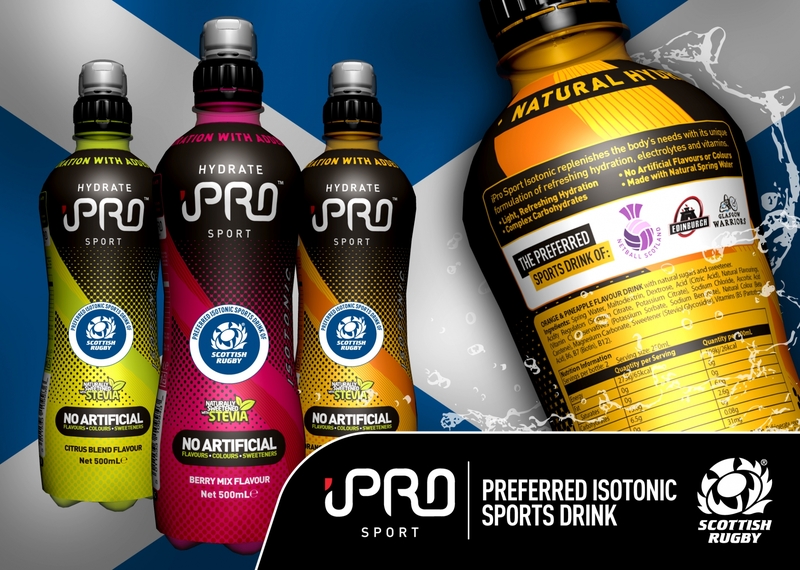 Following the exciting three-year partnership announcement with Scottish Rugby, iPro Sport have created an exclusive product label specifically for the Scottish market. iPro Sport, a hydration drink formulated with natural spring water, naturally sweetened with Stevia and available in three thirst quenching flavours: Orange & Pineapple, Berry Mix and Citrus Blend launches in Scotland with their new product label reveal with support from high street retail giants, WHSmith. The label will be embossed with the highly prestigious Scottish Rugby logo on the front and on the rear, the logo marks of Guinness PRO14 Rugby Union Clubs, Glasgow Warriors and Edinburgh Rugby. New to the iPro Sport family of sporting partners, and fresh off the back of qualifying for the Netball World Cup 2019, Netball Scotland’s logo will also appear on the rear of the label. iPro Sport is a company focused on environmental sustainability and are supporters of the global agenda tackling the critical issue of plastic. The plastic packaging used in the manufacture of iPro Sport is 100 % recyclable, positively impacting on the environment. “Significant investment and development has gone into perfecting our hydration drink, including multiple recipe modifications avoiding the use of artificial colours, flavours and harmful sweeteners such as aspartame. iPro Sport are providing fans of the product with an opportunity to meet in person Scottish Rugby Stars, have their photo taken and receive a signed bottle of iPro Sport on Saturday 17th February at WHSmith Glasgow and WHSmith Edinburgh high street stores from 12:30pm. Scottish Rugby have today confirmed that Scotland International players, Ben Toolis and Simon Berghan, both of whom played in the NatWest 6 Nations victory over France last weekend, will be attending the launch hosted by WHSmith, Edinburgh. iPro Sport Partners, Glasgow Warriors have also confirmed that Guinness PRO14 players, Zander Fagerson and Callum Gibbins will be supporting the launch hosted by WHSmith, Glasgow. Friday 16th February at 12 Noon. iPro Sport are fast becoming the leading supplier of Isotonic Sports Drinks to the world of sport. From professional athletes to grass-root clubs and universities, iPro Sport is THE name in isotonic hydration, not only in the United Kingdom, but across the globe in Australia, the Middle East, Cyprus, Continental Europe and many more countries coming on board in the very near future. Partnerships within sport and continued endorsements from club nutritionists and sports performance coaches are testimony to iPro Sport's ability to deliver great hydration and aid recovery. © Copyright 2019. iPro Sport.